We've introduced publishing workflow to corporate information pages, for example, 'working for...', 'procurement at...' and 'media enquiries'. Previously, any changes you made to these pages would go live immediately. 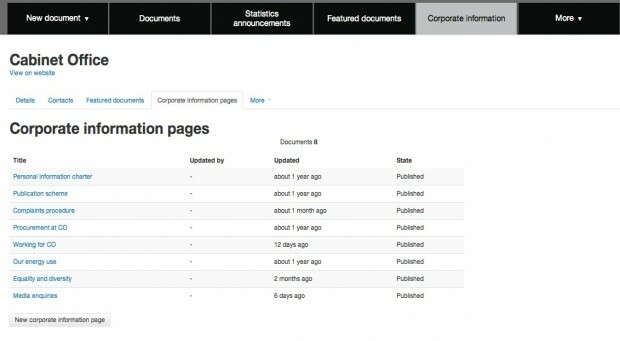 If you click on the 'corporate information' tab at the top of the publishing tool you'll see which formats now have a workflow. This means you can make changes to those pages without them going live straight away. More importantly you can now use the publishing tool to help you get any changes checked by another editor before you publish. We've done this to allow departments and agencies to have better visibility and control over this important content. Just create a new draft of your published document, send it to 'submitted', get it checked by someone else and publish it. You can leave notes, reject drafts, see who made which changes and all the usual stuff. After it's published you can find it in the 'documents' tab, as you would find publications and detailed guides. There's currently a bug which means you can't unpublish or archive these pages. We're working on fixing that very soon. If you need to unpublish or archive anything in the meantime, raise a Zendesk ticket. In a future release, we'll be adding a new corporate information page called "what we do", which will add workflow to the "about us" information. As ever, let us know what you think in the comments or through Zendesk. This is good news. Please can we also have this facility for groups, topical events and organisations. This would be very useful editorially and save an awful lot of time in creating mock-ups for new and transitioning content. Glad you will find it useful. Yes, we plan to add workflow to formats that don't currently have it. It's a complex feature to build so it won't happen immediately, but we know how much you all need it. Technically yes: you can feature several types of content on the organisation homepage. Style-wise, the Content Team are best placed to respond. As ever, this should be based on user need. I think your example of featuring 'Working for X' during a recruitment campaign, is a good one. If users will be actively seeking out this information - as they probably would during a recruitment drive - then featuring it on your homepage makes sense. There's probably less of an argument for featuring something like the publication scheme or the complaints procedure.